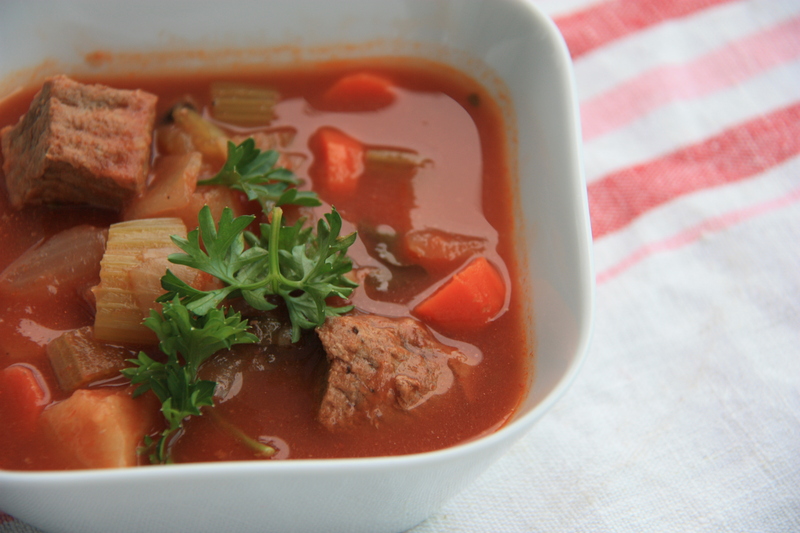 This soup is a hearty classic perfect for a cold winter night. Left overs make a great lunch when paired with crusty bread for dipping. In a large stock pot or dutch oven over medium heat, heat oil and add stewing beef and saute until browned on all sides. Remove beef, and set aside. Add chopped onion, carrots, celery, and mushrooms to the rendered fat in the pot and cover. Stir every couple of minutes until vegetables are tender and mushrooms release their juices, at least 5 minutes, and season with salt and pepper. Pour in stock, and reserved beef to the vegetable mixture. Bring the mixture to a boil and skim off and discard any solids (scum) that floats to the surface. Tie the herbs into a bundle with kitchen string to keep them from separating in the broth and add to the soup with the can of tomatoes. Season with salt and pepper. Simmer for 1 and a half hours, or until the beef is very tender. Discard the herb bundle and bay leaf before serving. Check for seasoning. Serve and enjoy! If you love certain vegetables you can add them in. The more the merrier! You could include frozen green peas, or chopped green beans, but add them in the last half hour of cooking so they do not get mushy.